Another common mechanism that is covered in the first weeks of organic chemistry is the free radical halogenation of alkanes. This mechanism utilizes the homolytic cleavage (one electron per atom) property of halogens when exposed to heat or ionizing radiation (i.e. hv), which is a popular mechanism for future reactions in the course. Radical halogens can extract the proton from a C-H bond to produce the corresponding acid and generate a radical carbon center. In this article we will discuss all of the tips and tricks to getting an ‘A’ on your racical halogenation questions. Sign up with StudyOrgo today for more in-depth mechanism coverage and answers to all of your organic chemistry questions! Generating a radical halogen: there are THREE critical steps to free radical reactions. 1) Initiation: The Br2 single bond is broken by high energy ligh (hv) to form radicals placing one electron on each atom. 2) Propagation: (Hint: One radical reacts with a single bond to form another radical, thus propagating the radical species to drive the reaction forward. a) Radical Br abstracts one hydrogen from a C-H bond in propane to form radical propane and HBr. 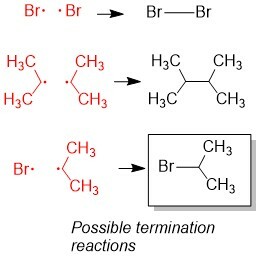 b) Radical propane asbracts one Br from Br2 to form the bromoalkane and radical Br, thus restoring the reactants for another round as shown in step 2a. 3) Termination: Any two radicals combine to form a single bond. These species will be in low abundance. Hint: Radicals are destroyed by combining two radicals to form a single bond. This eliminates the radical necessary for radical alkane formation (green boxes) as shown in step 2a and ends the reaction. Radical bromination will always replace the C-H bond on the MOST substituted carbon center because the stability of the radical intermediate is higher with increasing substituents on the carbon center. This selectivity is the same, but a weaker consideration, for radical chlorination which obeys Hammond’s Postulate, which says that stability of the radical center is outweighed by the extreme exothermicity of radical chlorination (compared to bromination), thus a mixture of chlorinated products is observed. 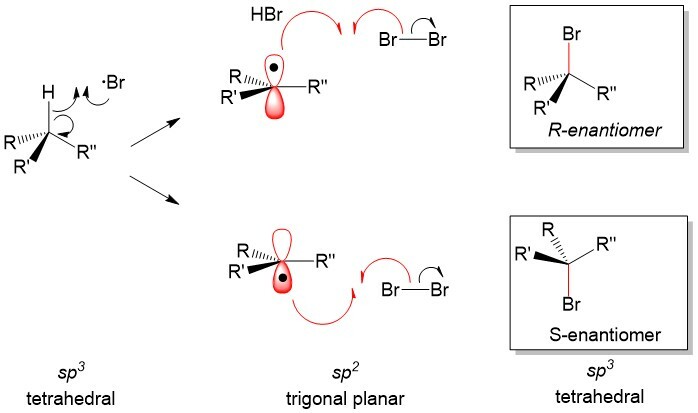 Radial intermediates (step 2a product) produce a sp2-like hybridization orbital with the lone electron in the vacant 2p orbital, therfore attack of the radical electron on the C-H bond can take place from either side of the molecule. The result will always produce a racemic mixture (or equal amount) of the two enantiomers.